The Mistral Class deal with Russia has been very controversial from the start, and in a major reversal today by the French Government, it looks like the delivery of Russia's new amphibious assault ships will be withheld due to that country's continued destabilizing involvement in the Ukrainian conflict. This change in policy out of Paris comes as the EU considers much harsher sanctions against Russia if they continue their shadow war in eastern Ukraine. These new sanctions include, among other things, greatly restricting Russia's access to foreign finance for its energy sector, which continues to be Russia's shining fiscal star out of an overall domestic economy that has hit the skids, the Russian Ruble has already hit an all time low. Additionally, these sanctions would also strip Russia of the right to host the 2018 World Cup, which would be seen as a huge setback on the international stage following Russia's hosting of the 2014 Olympics in Sochi. Going forward, it is not clear what Russia would have to do to be able to acquire these ships as planned, nor is it clear what type of penalties, if any, France will have to pay for not delivering the ships as promised. 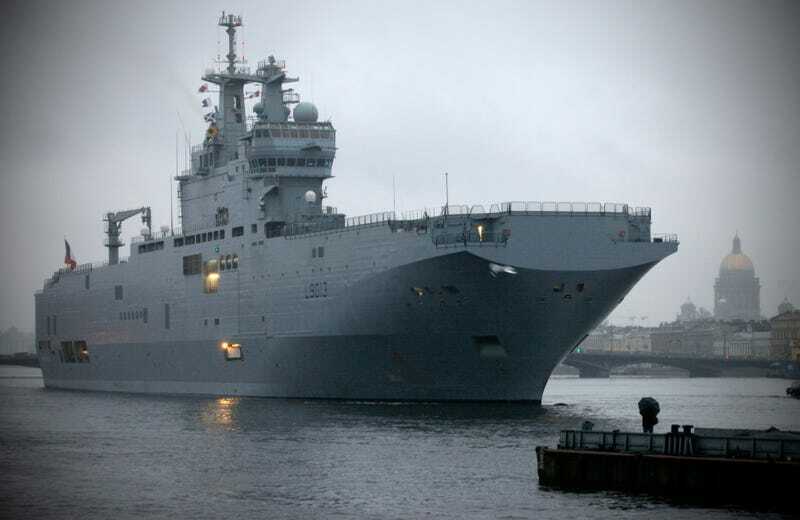 The choice to withhold these capital ships could also be partially a result of Russia's statement that they would not pay for the pair of primarily French-built Mistral Class carriers until they were both fully finished and operational under the Russian naval flag.